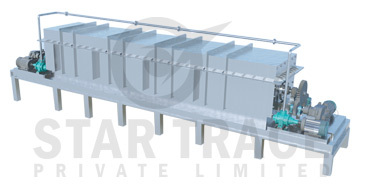 STAR TRACE Retorts and Vacuum distillation ovens ranging from 0.5 cubic feet to 40 cubic feet material capacity. Both fuel fired and electric models are available. Mercury condensing and handling systems are included with all retort systems. Rotary Retort Furnaces have long been used for the continuous heat treatment of a variety of Raw Materials. The rotary retort furnaces is particularly adaptable to controlled atmosphere Operation up to 500°C. These furnaces are particularly well suited for the processing of Raw Materials because the rotary conveying action tumbles the Materials, breaking up any jams or tangled clumps facilitating more thorough heat treatment of each of the individual part. The traditional rotary retort concept is not without problems: improper and uneven loading, jams of parts formed at the charge end that cannot be broken up in the retort, the maintenance of rotary bearing and seals within the heated shell and the loss of controlled atmosphere. The rotary retort has a charging door mechanism that works with a loading mechanism to load controlled, pre-selected weight charges of uniform size parts into the retort, minimizing the loss of any controlled atmosphere. The Stainless Steel retort is supported for rotation at only one end, outside of the shell, such that the retort is cantilevered into the shell with the free end extending into the furnace shell. This design requires less maintenance and is more efficient at conserving controlled atmosphere than designs with internal rotation within the heated shell. Auger flights convey the parts smoothly and quietly through the furnace. Rotation of the retort has a wide range of speed adjustment to provide complete flexibility of time processing cycles.The edges of the internal auger flights are integral with the inside wall of the retort to prevent parts from getting stuck. Stainless Steel retorts have superior mechanical strength characteristics compared to work Mild Steel designs. Furnace lines are pre-engineered in standard sizes with rated capacities from 225 KG to 450 KG. No special pit or foundation. Low maintenance : maintenance is limited. Flexibility : small or large production runs can be handled alternately or continuously; close control of furnace operation is easily obtained. Automation : heat treating is completely automatic after loading Raw Materials into hopper. Uniform loading : a specially designed vibratory hopper and weight-actuated skip loader deposit precisely measured charges into the furnace. To complete the rotary retort Raw Materials heat treating line, offers a rotary retort draw furnace with the same cantilevered retort design advantages as the rotary retort hardening furnace. The furnace features a recirculation system designed to keep heated gases in contact with the work as it progresses through the cycle. Convection heating is used to full advantage for efficient heat transfer in a minimum floor space. The furnace required no pit or special foundation. The rotary retort draw furnace offers operating temperature ranges variable from 149°C to 649°C maximum. The rotary retort draw furnace is completely manufactured in our plant as a package unit with integral control panel. The customer needs only to connect utility lines to place the unit in service.